NB: A version of this post also appears on The Violent World of Parker. Featured as one of this week's Friday's Forgotten Books. In the previous Parker Progress Report – my overarching title for my continuing blogging journey through Donald E. "Richard Stark" Westlake's twenty-four book series starring taciturn heister Parker – I took a look at the seventeenth Parker, Comeback (1997), originally published twenty-three years after the sixteenth Parker, Butcher's Moon (1974). 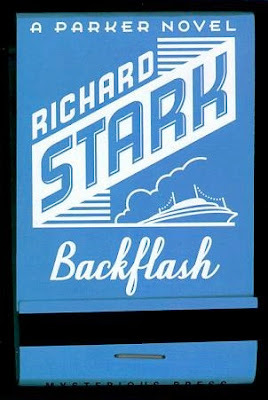 Luckily, Parker fans didn't have quite so long to wait for the next book in the series: Backflash arrived just one year later, in 1998. 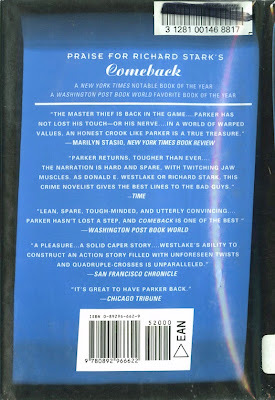 Clearly, Westlake was back in the Parker groove; where Comeback had taken him twenty years to write (on and off... mostly off), now he was writing the Parkers fast again: a new one would appear every year or two until the author's death in 2008. Whether that's why Backflash is a better book than Comeback – which, to my mind, it is – I don't know, but it's at least notable that that's the way Westlake wrote the Parkers in the original 1962-1974 run. 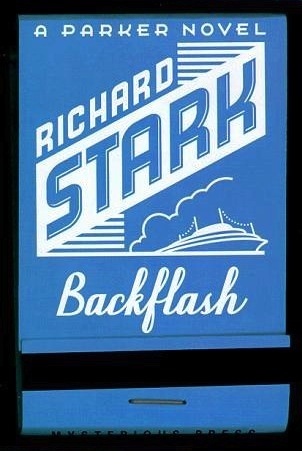 And actually, as with Comeback, Backflash could quite easily have slotted into that original run. It starts with a "When"; it's divided into four parts; and Parker's cohorts all hail from earlier books: racetrack driver Mike Carlow from The Rare Coin Score and Butcher's Moon; stout, fastidious expat Lou Sternberg and female heister (heistess? With the meistess?) Noelle Braselle from Plunder Squad; and professional wrestler Dan Wycza from The Score and Butcher's Moon – in the latter of which, like Comeback's Ed Mackey, Wycza seemingly came back from the dead. Although we never actually witnessed Wycza's death in the first place – Parker merely reports it in The Rare Coin Score with a perfunctory "He's dead", while Westlake heralds his resurrection in Backflash with an equally perfunctory, "There was a rumor he was dead for a while, but then he'd popped up again". And the score is classic Parker too; novel, sure – Parker and co. take down a floating casino on the Hudson River – but a straight cash grab nonetheless. Mind you, straight doesn't necessarily equate to straightforward: the heist itself goes as planned, but as is often the way in a Parker story, the aftermath gets bloody. There's a belief among some Parker fans that the later books, and Parker in particular, are somehow softer than the earlier ones – that Westlake and his most famous creation mellowed with age. Frankly, I see little evidence of it here. From Parker's blunt assessment of a co-heister's condition following a car crash at the start of the book ("You're fucked") to his cold, calculating tying off of a – all-too-human – loose end in the latter stages, he's as heartless – and ruthless – as he's ever been. 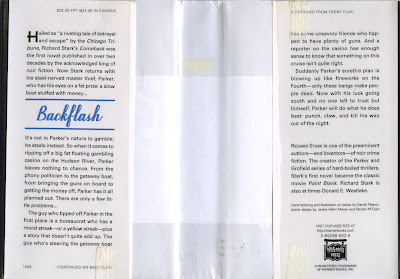 The odd mishap aside, traditionally Parker has usually only killed when absolutely necessary: to protect himself, his money, his moll (Claire), or, and perhaps most importantly of all, his rep. And so it is in Backflash. That said, and to counter the "humanising" argument, I think it's possible to detect something new in his dispatching of his nemesis at the end of Backflash – an even deeper chill. Parker's never been a (movie) James Bond, dispensing terminally unfunny quips as he offs not-quite-as-bad-as-he-is guys, but he has proffered the occasional one-liner, perhaps the best being "Now you're the message" in Butcher's Moon. As menacing as that is, though, his closing one in Backflash strikes me as being even colder, simply because of the distracted, offhand manner in which it's delivered. With his adversary gut-shot and writhing in agony at his feet, Parker reflects on the act of mercy at the start of the novel which ultimately led him to this point. Ignoring the guy's "panting and spitting out words", Parker muses, "We live and learn", and shoots him in the eye. Of course, having made the same merciful mistake with George Uhl in The Sour Lemon Score (Parker #12) and consequently paid the price in Plunder Squad (Parker #15), you'd have thought that's one lesson Parker might have taken to heart by now. If only he had one. Next – the basis for the imminent Taylor Hackford/Jason Statham Parker movie: Flashfire. I live right by the Hudson River, and while we don't have any floating casinos to my knowledge (we have some brick & mortar ones, times having changed), Westlake really does capture the setting perfectly. Even in Manhattan, much of the riverfront is a kind of no man's land, where you m might find almost anything--a dead body (just this past Tuesday, ten minutes from where I live, though I didn't find it), somebody's private fishing pier nailed together out of found lumber, and I'm sure there have been pot farms. Also you will occasionally find me and my dog, walking alongside the railroad tracks. They keep threatening to clean it up, and they just might do it one of these days. But something tells me it'll always be no man's land. I do like this one a lot--it harks back a bit to "The Score", with the finger for this heist having his own personal score to settle that he doesn't want Parker to know about, and he thinks he can use Parker. The antagonist is a lot less formidable than George Liss, and Parker's only real enemy is lack of information and simple fatigue (all that driving). It has Parker at one point in a situation I really don't like--you know how in the classic hardboiled PI story, the tough-as-nails cagey hero gets knocked out from behind? Well, that doesn't happen much to Parker, but it happens here. But hey, twice in 24 novels isn't such a bad record. I think it happens to Mike Hammer in every single book, but I'd have to actually read them to find that out. I kind of wondered if Dan and Noelle were going to become an item, given the obvious attraction between them, but I guess we'll never know. Maybe Noelle figured it's not a good idea to play with the people you work with, having already made that mistake once. Or maybe it was just harmless workplace flirtation. The heisters are really likable in this one--Dan, in particular, shows his compassionate side, such as it is. I don't think it's really about how 'hard' or 'soft' they are--it's about the situation. The Stark heisters aren't mindless killers--they don't use more violence than they have to. It's just bad policy. It's sloppy, and unworkmanlike. If you can avoid killing, you do. That's why Parker likes working with these people. People who enjoy killing are trouble. Ordinary law-abiding people do things just as cold, and colder, all the damn time--good friend of mine, older man, died in a lousy nursing home last year because his only sister wouldn't lift a finger to get him out, even for Thanksgiving dinner--just concentrated on disposing of his personal items as quickly as possible, making sure all the proper forms were filled out--when she called to tell me he was dead, she told me "we loved him, but we didn't like him." BRRRRR. A bullet in the eye would have been much quicker. What made Parker come across as particularly 'hard' to me in this book was his slapping a woman hard across the face with one of those big veiny hands of his (which you will recall we were told when we first met him were made for slapping). She's not badly hurt, but she just can't believe this has happened to her. Her entire self-image collapses before our eyes. Now we are not supposed to like this woman at all, she's a bit of a petty tyrant in her world, though we learn she has her reasons (as do all nasty people), but it's still shocking, given the relatively modern era this book is set in. It's supposed to be. Westlake is reminding us how the terms of power can change when the situation changes, and how it's a mistake for anyone to assume he or she is going to be powerful in any situation. Power is an illusion, always, unless it comes from inside of you. For most of us, power comes only from our position in life, and that, sad to say, is never assured--for anybody. Be interesting to read your next progress report. Timely. Timely indeed – it's almost like I planned it, innit? Also – Chris, mate: you really need to set your own blog up! 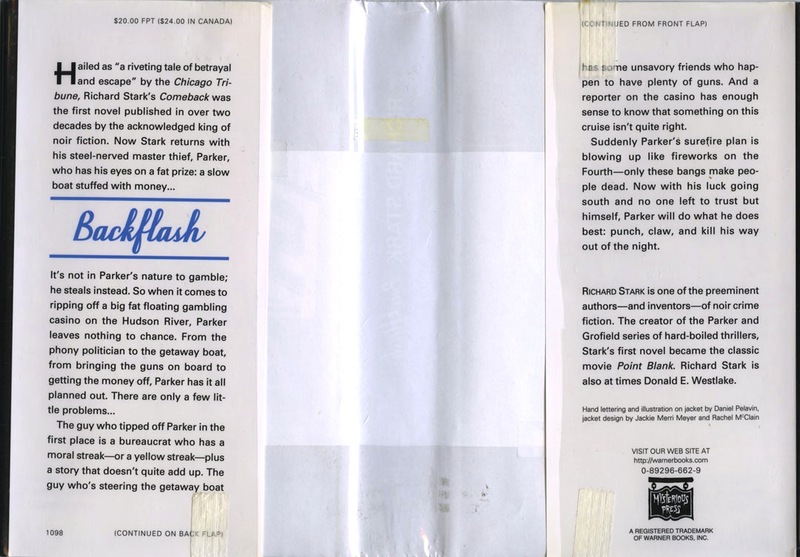 The next Parker novel, FLASHFIRE, is the basis of the PARKER movie opening on January 25th. George: It is indeed – I mentioned that at the bottom of the post, but ta for emphasizing. Sadly, it looks like it's not actually out here in the UK until March. Grr. This is my favorite Parker of the later run. I love the heist and the set-up (riverboat casino), and I enjoy all the old-school characters, particularly Carlow and Wycza. Noelle is a great feminine heister that gives the novel a little different spin. Backflash is definitely in my top ten Parker novels. I've read all 24 novels in order in the last year, intermingled with Dortmunders. That was quite an experience. I agree with other comments stating that the next in line (Flashfire) is one of the weaker Parker novels, but the tagline on that novel "this way you have an always" is one of the best in the series.